True love comes in many shapes and sizes including in the form of a white fluffy pillow. Korean man Lee Jin-gyu fell in love with his ‘dakimakura’ – a kind of large, huggable pillow from Japan, often with a picture of a popular anime character printed on the side. 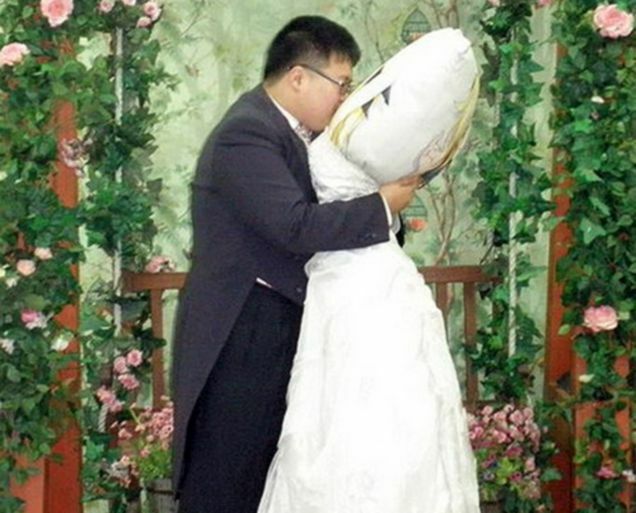 Now the 28-year-old otaku (a Japanese term that roughly translates to somewhere between ‘obsessive’ and ‘nerd’) has wed the pillow in a special ceremony, after fitting it out with a wedding dress for the service in front of a local priest. ‘He is completely obsessed with this pillow and takes it everywhere,’ said one friend. ‘They go out to the park or the funfair where it will go on all the rides with him. Then when he goes out to eat he takes it with him and it gets its own seat and its own meal,’ they added. One can only imagine what freaky things he does to his “pillow,” when “they” are in bed together and “he” isn’t sleeping. Hmm, I wonder if this man’s pillow is a guy or a girl? Ha-ha! Weird only begins to describe it. It looks homemade! Wow. That’s both bizzarre and interesting. I wonder what the honeymoon was like. Does he pay rides for pillow? I also heard about a woman who married Eiffel tower!